Out comes The Valley Below, a great four-course film by writer/director Kyle Thomas. This feature debut by the Calgary native and Concordia grad joins a strong crop of fresh Canadian filmmakers enlivening the Canadian scene with films rooted deeply in character and place. Thomas makes evocative use of the small town of Drumheller that serves as Valley’s barren setting—the beautiful arid landscape has also doubled for the expansive American west in westerns such as Clint Eastwood’s Unforgiven—and the powerful, yet desolate, imagery of the Drumheller horizon imbues twists of both hope and misery throughout each of the film’s four acts. The film begins with a beautiful sunset as Kate (Mikaela Cochrane) and Henry (Jo Perry) dabble in young love before Kate heads off to college. This first act opens The Valley Below in the warm season of summer—not quite the time for new beginnings that spring offers, but sometime fun, free, and reckless. Kate can’t quite share Henry’s sense of liberty, though, for she discovers that she’s pregnant just before they head into the badlands to do some camping and kayaking. This section appropriately features the music of Rae Spoon, whose electric songs fuel the recent documentary My Prairie Home, and Kate’s story marks itself at the crossroads of possibilities: she can either escape and be free, or enjoy the view in Drumheller but remain forever trapped in a fun and seemingly harmless relationship. 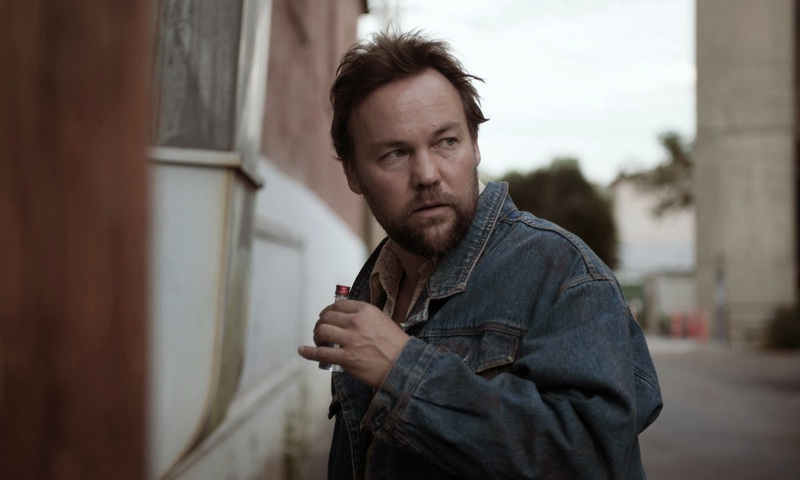 Warren, played by poet laureate and Canadian Screen Award nominee Kris Demeanor, has a baby that he rarely sees as the second act of The Valley Below takes audiences into the dimming fall of Warren’s story. Warren, an unambitious drunk, alienates himself with his crippling alcoholism: he loves his family and his loves his music, but neither one competes with the escape he gets while chugging a beer and earning a living on the Zamboni. The music of Eamon McGrath and Demeanor’s strong, understated performance shifts The Valley Below away from the new love of summer to the kind of love that doesn’t go much further than the ringed watermark of a beer bottle on the bar. Love feels completely lost, however, in the third and strongest act of The Valley Below when Thomas put the townspeople of Drumheller in their winery discontent. This chapter glimpses into the stalled marriage of Kate’s parents, Gordon (Stephen Bogaert) and Susan (Lori Ravensborg), as they try to revive their love through communication and forced intimacy. Their relationship offers a snapshot of what sits on the horizon for Kate if she stays in town with Henry, and the contrast between both parents effectively conveys the paradox of both love and small town living: things tire with routine and one can either make the best of it or get the heck outta Dodge. The third act of The Valley Below brings the film to its richest visual and thematic culmination as it zeroes in on Gordon, who tries in earnest to make the best of his life of predictability and routine. Bogaert is extremely effective as Gordon undergoes a complete existential crisis while going through the motions of his trade and safe haven: the art of taxidermy. As Gordon prepares and stuffs a buck to the poignant score, provided by Gavin Gardiner of The Wooden Sky this time, The Valley Below captures the rhythm, pace, and atmosphere of small town life and character. Bogaert, staring into the glass eyes of the dead deer, finds a powerful reflection of himself that doesn’t see the same endless opportunity that Kate sees in her youth. The consequences of living amidst such desolate beauty hit their peak when spring comes and sees Drumheller from the vantage point of the town’s most optimistic saviour, its local police constable/radio personality, Barry (Alejandro Rae). Barry, a friend of Warren’s ex and a client of Gordon’s, finds happiness that the three wanderers of the other tales have yet to find. His relationship might be the most unconventional of the four, but it’s the most functional as it’s built on love and mutual respect. (Which finds a much better way of expressing itself than, say, a film with Mr. Grey.) The music of Dan Mangan, which includes the Screenie-nominated song “Wants,” guides The Valley Below to both a powerful and pragmatic finale. None of these stories escape without a hint of tragedy, but the low key conclusion simply gives a rich portrait of life as it is in a small town bound by loss and barren landscapes. The conceits of the changing times and the alternating composers work in harmony as each set of sound and images is both discrete and complementary. The natural light juxtaposes the various characters of the landscape and natural setting just as the moods and musical themes for each sequence create the atmosphere and psychology of the characters. Each sequence works in harmony by commenting upon its peers and building a community: these lives are unique, but they’re intimately connected. The four acts play off one another like a quartet of short stories. The highly literate atmosphere, characterization, and dialogue rightfully earns comparisons to Raymond Carver, with whom y’all should be freshly familiar thanks to Riggan Thompson’s What We Talk About When We’re Talking About Love, which could easily double as a subtitle for the film given Warren’s Carver-esque boozing and the ensemble’s many musings on the highs and lows (mostly lows) of love. The great sense of place and artful sparseness, however, likens itself more to the world of Alice Munro even though The Valley Below is more a tale of men than of the lives of girls and women. Maybe if Alice and Ray got all liquored up and listened to the CBC they might conceive something like this, but Thomas’s excellent hand at character, observation, subtlety, and symmetry makes for a unique voice in its own right as whips up four strong slice-of-life servings. It’s a fine and promising debut. The Valley Below kicks of the Canadian Independent Film Series on March 4. It opens theatrically in Toronto, Ottawa (Kanata), Calgary, and Vancouver on March 6.